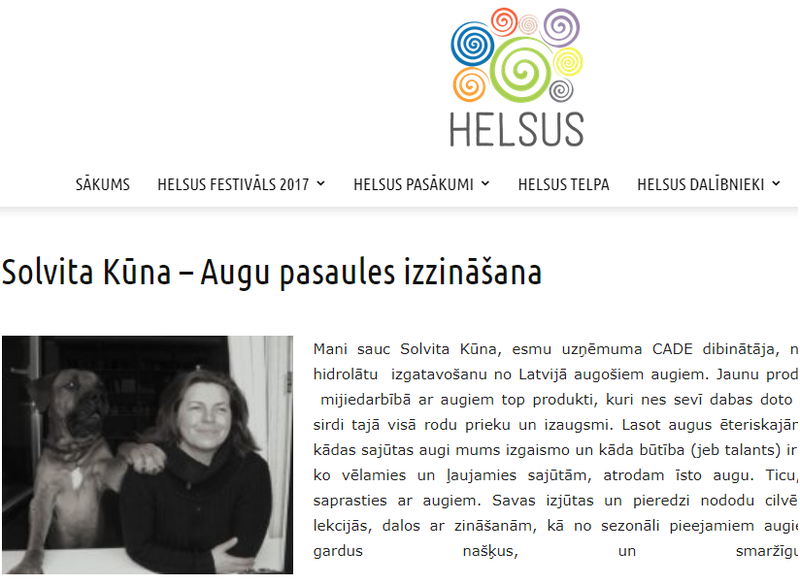 I'm Solvita Kūna – the founder of the company CADE. We produce essential oils and hydrolates made from the plants and herbs growing in Latvia. Developing of new products is my passion and my products are created in the interaction with the plants - they contain the power of nature. Being involved in this process with all my heart, I find in it joy and personal growth. By collecting the plants and herbs for essential oils I have acquired experience of which feelings in us are highlighted by different plants and what the nature (or talent) of each plant is. If we know what we want and let our feelings lead us, then we find the right plant. I believe that everybody has the ability to communicate with plants. I transfer my feelings and experience to people in practical classes and lectures, I share the knowledge of how healthy and tasty snacks or aromatic & natural cosmetics can be made from the seasonally available plants. I look forward to meeting you in my masterclasses, where we will learn about the plants and herbs. And, of course, we will have a talk about practical things: how to prepare honey mixtures, body scrubs and floral waters for yourself and your family.